"I will explore this with you but I run this operation down to the smallest detail. If you have a problem with that, we can all go home right now." Heists are often enjoyable motion picture viewing because the intricacies of the plan and the mixture of personalities can provide sparks of interest and suspense. The potential for betrayal and the ominous ramifications of greed can make for compelling drama. The Score had a decent amount of publicity when it came out, due to the cast and as well as the notorious stories of director Frank Oz's relationship with his actors, particularly Marlon Brando. The film has much going for it and critical reaction was generally favorable, yet it disappeared quickly from the big screen. Now it can be found on the shelf to watch at home on DVD, rather than loading up the family and paying a C-note to see at the theater. I knew there would be problems with The Score when I saw in the credits that 5 different people worked on the story and screenplay. This, added to the inevitable improvisations of the big-ticket method actors in the cast, can be a recipe for a muddled disaster. Fortunately, director Oz shows himself to be up to the task by minimizing the weaknesses of the first half of the movie, which features some rather clumsy improvised set pieces, and driving us on to the second half, which focuses on the planning and execution of the robbery that will lead to "the score" of money. Nick (Robert DeNiro) is first seen pulling a robbery in Boston. A high-tech safecracker, Nick steals a valuable jewel and, upon his return to his hometown of Montreal, meets up with his fence, Max (Brando) to deliver the goods. Max has a new job in mind for Nick that could potentially be the biggest score of his life. However, the job will require the very careful and meticulous Nick to break rules that have made him a successful thief for two decades. The object to be stolen is located in Montreal and Nick has sworn not to work in his own town. Although he always works alone, in this case Nick will have to work with a partner. He determines that this will be his last job, as the take from the theft will be enough to pay off the jazz club he owns and allow him to establish a real relationship with his girlfriend Diane (Angela Bassett). Later, on the street, he meets what appears to be a retarded man who is lost. This turns out to be Jack (Edward Norton) his soon-to-be partner in the operation. Jack is a cocky young thief who has been posing as a night janitor in the building that will become their target, the Montreal Customs House. Right from the start, the two men are conflicted in their goals in this operation. They embark on a complex plan to defeat the security of one the most secure buildings in Canada. The improvisational acting adds characterization and spontaneity to some of the scenes, but many times it introduces distracting irrelevancy. The triumvirate of big name actors provides plenty of workshop material as they take the original script and work their own brand of magic on it. But, in this case, I would say, "Guys, stick to the script." Some of their eccentric, ad libbed bits are almost inspired; others seemed designed to take us out of the movie and force us to remember who it is that we have the privilege of watching act. In many ways, DeNiro reprises the role he played in Heat with Al Pacino and Val Kilmer. In both that movie and this one, he is an anti-hero thief who is the best at what he does, but struggles with the nature of his profession and is looking for a way out, to assume a legitimacy in his life. In the commentary, Oz mentions that often DeNiro would reduce the number of his lines in his scenes "for effect." I had the feeling that it was just because he did not really want to talk too much. His character is laconic to the extreme, although this is effective as the watcher is taken by surprise when he speaks polysyllabically and shows any spark of emotion. It seems sad to think that DeNiro is using up his best acting chops on stuff like Meet the Parents and The Adventures of Rocky & Bullwinkle. As his younger partner, Norton's performance is a mixed bag with plenty of excess in his scenes. He overacts shamelessly but it is well within character and adds much needed jolts of energy to the very sedentary first half. Norton is one of those young actors on the rise and the contrast of him and DeNiro makes for some compelling screen time between the two. Brando is fine in one of the smaller character roles that have defined the best of his later career in films such as The Freshman, A Dry White Season and Apocalypse Now (Redux). At his best, Brando adds layers of potency to a film and raises the bar for the actors around him. However, at his worst he can open the door to the acting irrelevancy that has marred so many of the his performances of the last two decades. In this film, fortunately, we get more of the former and only a touch of the latter. The Score is not perfect, but it is very enjoyable on several levels; it is simply entertaining to watch these actors in their scenes together. It is an interesting story that moves quickly and maintains attentions with its twists and turns. The overall direction of the film is consistently creative; innovative uses of light and color enhance the visuals of the picture. Montreal is a beautiful setting and is used very well to give a unique sense of place, different from the typical New York/Los Angeles angle. One of the nice aspects of this film is the lack of overt violence to jazz up the story. Although this lays bare some of the flaws, the intellectual quality of the acting makes up for it in the first part and the complexity of the heist overwhelms it in the second. Overall, this is a very well-made film and a credit to the crew that worked on it. Image Transfer Review: The Score has a very clean transfer that nicely illuminates the wealth of color and detail in the film. The image is very crisp with very few artifacts detected and edge enhancement all but unnoticeable. This film is very stylishly directed and the DVD provides an excellent opportunity to enjoy the faces, the settings and locations. Although much of the story takes place in smoky, darkened rooms alternating with the sunny streets of the city, the image provides a consistent level of quality whether showing a close up on one of the famous noses or the lovely reds and oranges of a northern sunrise. Audio Transfer Review: The excellent soundtrack is in Dolby Digital 5.1 English and Dolby Surround in French and English. Each is a lovely rendering of a technically well-crafted film. Less is more as the film features much silence and low conversation that sets it apart from so many others that are jam-packed with Foley effects and seem to need a musical accent every time an actor scratches his nose. The surround effects were very effective in adding to the awareness of situation, whether in the jazz club, in a tunnel or on the street. With the two legendary mumblers, Brando and DeNiro, going toe-to-toe in several scenes, one could fear that their bon mots might be drowned out by the least tinkling of ice cubes. However, I can report that every improvised bit is preserved for eternity, with clarity. Extras Review: The disc features a very good menu design that is active without being too flashy or annoying and a decent set of extras. Along with the theatrical trailer, we find some alternate takes of some scenes and a featurette. The Making of the Score (12m:15s) is pretty much a typical promotion piece, but has some interesting discussion by the actors (sans Brando), the producers and the director. The alternate takes include a short music clip of Mose Allison (:45s), an alternate version of a scene between DeNiro and Norton (2m:07s) and, most interestingly, a 5-minute sequence of Brando and DeNiro performing three versions of the scene in which Nick agrees to do the job. These takes provide a fascinating look at the techniques of method acting, as well as a perfect example of where it can go wrong in a tightly drawn thriller such as The Score. The audio commentary by director Frank Oz and director of photography Rob Hahn is very detailed in its discussion of the technical aspects of making the film. As a "Laurel and Hardy" act, the two could use some better jokes. Their commentary is a little too detailed and a bit repetitive for general listening, although it would certainly be serviceable in a filmmaking class. Also, the fawning over the performances gets to be a bit much. Oz, at one point, makes reference to the difficulties of personality clashes during production but gives up no dirt and nowhere does he confirm the wire story that was on all the news sites that Brando would show up on the set wearing no pants to force the director to shoot him only from the waste up. 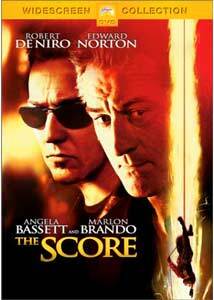 Unfortunately overlooked in the theaters where audiences are looking more for explosions and automatic rifles in their crime dramas, The Score features fireworks of a different kind: representatives of three generations of American acting coming together to dance within the formula of the heist movie. DeNiro, Norton and Brando jump out of the screen with complex portraits of shameless criminal anti-heroes scheming to take off the Customs House in Montreal. This film is great fun and is certainly worth a watch.